We know that shoes are a key part of personal grooming, and therefore a reflection of who we are to the outside world. We also understand that shoes can be expensive and that keeping them in good repair is a better means of extending the life of your favorite pair of shoes. Kiwi Suede Cleaner - 4.25 oz. Kiwi Suede Protector - 4.25 oz. Kiwi Paste Shoe Polish - Sm. 1.1/8 oz. KIWI® Suede Cleaner effectively removes dust and dirt from all types of suede and nubuck shoes, boots, coats, jackets, bags, and more. This special formula conditions and softens suede and nubuck to restore its natural surface texture. Kiwi Suede Protector provides protection against water and stains. Keeps suede and nubuck shoes, boots, coats, bags, etc. looking new. Coats footwear with a special polymer that creates an invisible shield to provide maximum protection against water and stains. Can be used with all colors. Kiwi Shoe Polish contains a time-honored blend of quality waxes which protect and nourish leather and produce a long-lasting, glossy shine in an instant. Volume: 1.1/8 oz. Kiwi Paste Shoe Polish - Lg. 2.5 oz. Kiwi Parade Gloss - Small 1.125 oz. Kiwi Parade Gloss - Black Large 2.5 oz. Kiwi Shoe Polish contains a time-honored blend of quality waxes which protect and nourish leather and produce a long-lasting, glossy shine in an instant. Kiwi Parade Gloss shoe polish provides a brilliant, durable, waterproof shine. Kiwi's multi-wax blend contains premium waxes and more Carnauba wax than regular paste polishes. Ideal for military and law enforcement applications. Kiwi Suede & Nubuck Stain Eraser removes stains and shiny marks from suede and nubuck leathers. The block crumbles during use to provide safe, gentle cleaning. Removes even deeply embedded dirt. Safe for use on all colors. Kiwi Suede & Nubuck Kit restores the appearance of old and worn shoes. Kit includes one stain eraser bar and a brush. The bar removes shiny marks and stains. The brush raises the nap of leather to its original appearance. Easy-to-use, quick-dry cleaning system. Kiwi Black Leather Dye restores the color and finish to worn leather shoes and boots before polishing. Long lasting and water resistant. Built-in sponge applicator top for easy application. Not for use on suede or fabric. Kiwi Conditioning Oil - 2.5 oz. Kiwi Conditioning Oil waterproofs and conditions all outdoor leathers. Contains a multi-refined oil of mink that penetrates deeply into leather, restoring natural oils, while conditioning and waterproofing. Keeps leather soft, supple and waterproof. Recommended for use on outdoor work and sport boots. Kiwi Heel & Edge renews the finish on shoe and boot heels and soles. Water resistant. Easy, built-in sponge applicator. Color: Black. This high quality paste gives a superior shine and covers scuffs. It provides a longer-lasting shine and better resistance to stains and scuffs. Kiwi Honor Guard Instant Spit-Shine Shoe Polish - 2.5 oz. Kiwi Honor Guard Instant Spit-Shine shoe polish provides a high-gloss finish to shoes and boots. Built-in sponge applicator for no-mess application. Specially made for use with military shoes. Available in Black. Kiwi Camp Dry Performance Fabric Protector - 10.5 oz. Kiwi Camp Dry Fabric Protector repels water, dirt and oil stains without darkening or discoloring. Restores durable water repellency on apparel to prevent "wetting out." Maintains appearance and breathability of fabrics, including performance materials like Gore-Tex. Ideal for all apparel and light-colored boots. Kiwi Camp Dry Heavy Duty Water Repellant - 12 oz. Kiwi Select Express Shine Sponge - 0.2 oz. Kiwi Camp Dry Heavy Duty Water Repellent bonds to leather and fabric to create an extremely tough water barrier, while still allowing the article to breathe. Ideal for tents, tarps, heavy work boots, hunting and work apparel, backpacks and boat covers. Odorless when thoroughly dried and cured. Kiwi Select Polished Leather Express Shoe Shine Sponge leaves a beautiful shine in seconds. Simply wipe on and you're done in an instant. No mess, no buffing. Do not use on suede, nubuck, or fabric. KIWI Leather Lotion is formulated to gently clean as it nourishes, conditions and replenishes oils for all finished leathers. After use, KIWI Leather Lotion leaves behind a soft luster. It keeps leather articles looking new longer and helps prevent leather from drying and cracking. 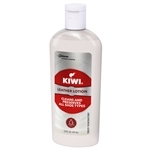 KIWI Leather Lotion is recommended for use on all colors of smooth or imitation leather on boots, shoes, briefcases, luggage, garments and other accessories. It is perfect for reptile and exotic finished leathers, too. Kiwi Whitener - 4 oz. Kiwi Color Shine - 2.5 oz. Kiwi Instant Wax Shine - 2.5 oz. Kiwi Whitener keeps white leather shoes and boots looking new. This specially designed formula contains an advanced polymer and whitening agent to help older, worn shoes look like new. Covers evenly, without streaks or chalky residue. Kiwi Color Shine liquid wax provides a deep, natural shoe shine in an instant. Kiwi's unique, long-lasting formula nourishes and protects leather footwear. Includes is a two-layer sponge with controlled dosage. Kiwi Instant Wax Shine liquid wax is a quick and easy, no-mess way to polish shoes. Delivers a high-gloss shine without the need for buffing. Water resistant. Built-in sponge applicator with controlled flow so you don't apply too much at once. Kiwi Scuff Cover provides an instant, no-buff shine to leather. Water resistant. Great for shoes, boots and more. Built-in sponge applicator for easy application. Not for use on suede or fabric. 2.4 oz. The Military Kiwi Desert Boot Cleaner is top rated when it comes to cleaning military footwear. It's formula will effectively remove any dirt, dust, and stain from suede and nylon upper. Easily press the brush and formula all around the boot for the full effect. Help clean and maintain your boot's appearance for a brand new look. The Military Kiwi Boot Protector protects and provides maximum protection against dirt, stains, dust and water. Protects suede and nylon uppers against dirt, stains and water. Spray over the boot's surface and let the boots dry for two hours. Keeping it protected every so often will extend the life and enhance the appearance of your boots. Won't darken or change color shade. Great for protecting, not cleaning. Military Boot Lace up your boots with Kiwi custom fit boot laces. These high-quality boot laces are made to last. Their 72-inch length makes them perfect fit, while the unique stay-tight weave makes them resilient enough for the most avid hiker. These water-resistant laces. They come semi-waxed and with sealed ends to protect them from the elements and to prevent breakage. All these features make these laces the perfect, dependable laces for anyone. Military Boot Lace up your boots with Kiwi custom fit boot laces. These high-quality boot laces are made to last. Their 87-inch length makes them perfect fit, while the unique stay-tight weave makes them resilient enough for the most avid hiker. These water-resistant laces. They come semi-waxed and with sealed ends to protect them from the elements and to prevent breakage. All these features make these laces the perfect, dependable laces for anyone. 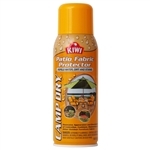 Kiwi Camp Dry Patio Fabric Protector - 10.5 oz. Kiwi Select Liquid Polish 2.5 oz. Rain and everyday wear and tear can take their toll on outdoor furniture and fabrics. KIWI® Camp Dry® Patio Fabric Protector is specially formulated to create a tough barrier that repels water, dirt, and stains from outdoor fabrics – without darkening or discoloring. KIWI® Shine and Protect is a convenient way to shine, nourish, and protect your leather shoes.